In the late summer some woodlands, scrub and hedgerows can seem to be awash with small birds with slender bills and legs, tirelessly on the go, nimbly flitting through the foliage. What are they? They are warblers. To give them their systematic name they are Phylloscopus or leaf warblers. There are currently thought to be in excess of seventy species of these "Old World Warblers" on our side of the Atlantic. Most are rather plain little birds — in muted tones of green, yellow, or brown — and identification, to say the least, can be difficult. Many are long-distance migrants. 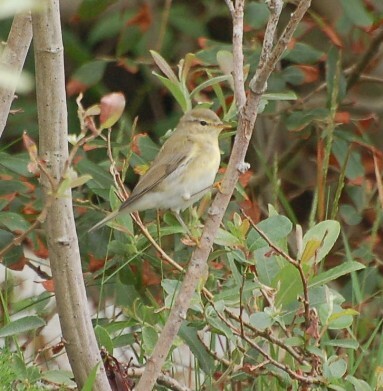 Here on Arran there are two species which are widespread, the Willow Warbler and the Chiffchaff. 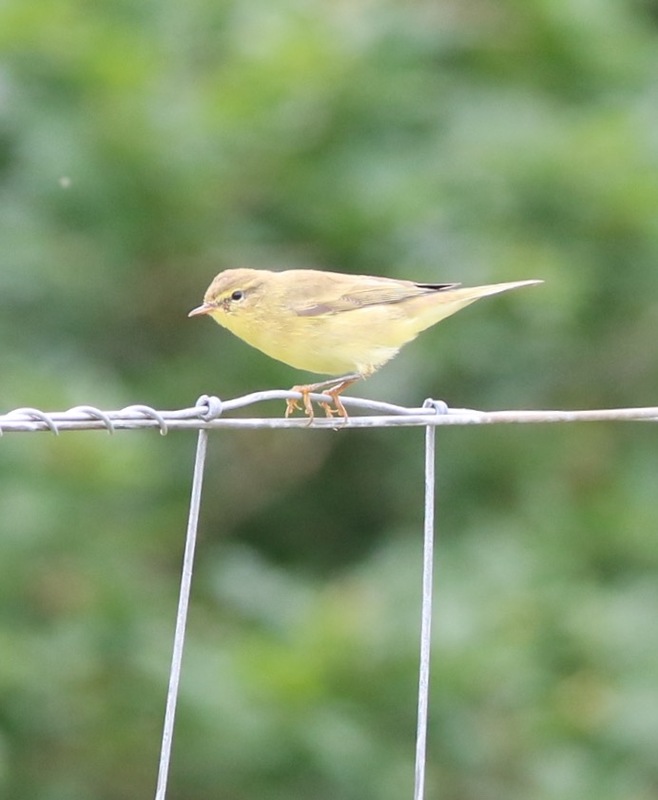 A third, the Wood Warbler, is increasingly rare on Arran. Last year there were records from only one area on the island. All three species are summer visitors to the island with most spending the winter south of the Sahara. At one stage these three species were considered to be one species, the "willow wren". It was Gilbert White, curate of the Hampshire village of Selborne, who first distinguished them as three separate species. Gilbert White was one of the first English naturalists to make careful observations of his surroundings and record these observations in a systematic way. He believed in studying living birds and animals in their natural habitat which was an unusual approach at that time, as most naturalists preferred to carry out detailed examinations of dead specimens in the comfort of their studies. The result of all his detailed observations was the publication in 1789 of his book called ‘The Natural History and Antiquities of Selborne’ and since that time it has never been out of print. It is one of the most published books in the English language.Within it, he distinguished the “willow wren” as three species - Chiffchaff, Willow Warbler and Wood Warbler, largely on the basis of their songs. Indeed the Wood Warbler gets its name from the trilling song performed by the male with gusto, head raised, bright yellow throat puffed out and body all a quiver. The scientific name ‘sibilatrix’ means the whistler. Song is still the most reliable way of separating these three species. Take time to use the internet to listen to each song because it is difficult to convey songs in words. Here is an attempt. Wood Warblers typical song is a trill that can be likened to a spinning coin coming to rest on a hard surface. Chiffchaffs sing their name – though sometimes they seem to get a little confused and mix up their "chaff" and their "chiff". Willow Warblers have a cascading song, that to me is a sound of spring. 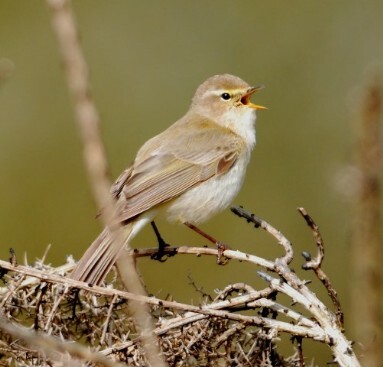 At this time of year at the end of the breeding season when birds are less likely to be singing it is a challenge to separate the two most widespread species on Arran, the Willow Warbler and the Chiffchaff. They are very similar to each other in appearance, and to make matters worse, most of the useful features can vary between individuals!Even within the species there can be a range in appearance. For example adult Willow Warblers are greenish, brownish with clean, largely whitish underparts. Any yellow on the underparts is usually restricted to the head and upper breast. By contrast in young Willow Warblers the entire underparts can be a uniform, bright, yellow colour.is a quote from a good bird book "Chiffchaffs often have a tendency to look ‘duller’, and ‘dingier’ than most Willow Warblers, with ‘dirtier’ looking underparts - although they can be as bright as the brightest Willow Warblers. They also have a tendency to continually flick their tail downwards while moving around." It is difficult to tell them apart. I tend to try and focus on the legs. In the Chiffchaff the legs are typically dark brown or black. In the Willow Warbler the legs are typically a pale brown or flesh colour. However colour as you know can be dependent on the light!